I am STILL waiting on parts to fix our van. The Peterson's van is in Durban, South Africa--six hours away. The transmission needs to be rebuilt or repaired. They are waiting on an estimate of what this will cost. Angela Thornton's vehicle was hit by a careless driver Friday night. She and the two girls riding with her could have easily been killed, but God protected them. We are waiting for insurance to fix her vehicle, but the man who hit her didn't show up at the police station as he was supposed to this morning. We waited for him for three hours, and the meeting was rescheduled for tomorrow. Mrs. Howard had some health challenges lately. Another pastor has lost his passport, so cannot attend. We REALLY need your prayer support right now! Would you please pray for this marriage retreat in a special way, and also ask our Father to help in each of the needs that I mentioned in the list? We believe Satan is fighting because God is doing something important in His Kingdom. United prayer from His children will bring victory! I just realized that I never posted our November/December newsletter online. It's been up on the FEA Ministries website for a month or so. You can read it there. https://feaministries.org/missions/gault/ Scroll down to the bottom of the page for the newsletter. 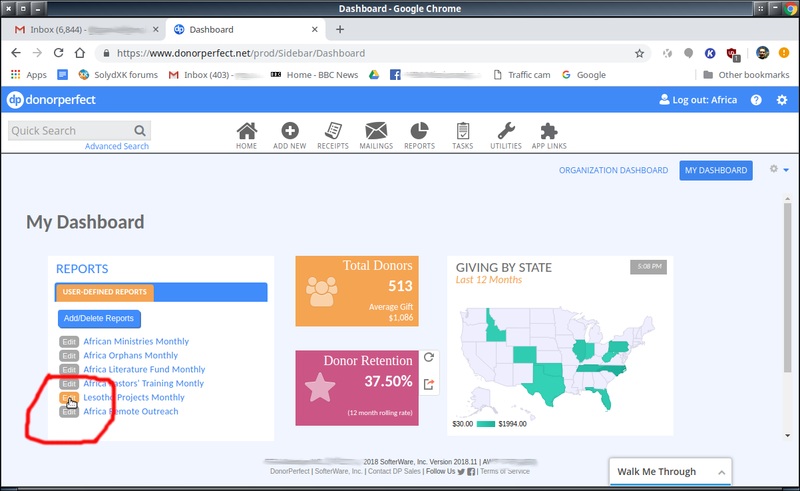 A year or two ago, FEA Ministries started using DonorPerfect to track donations. This software is a powerful, online app that lets us see who supports us, who gives to what projects, how much, their contact details so we can thank them, etc. All this is pretty much in real time, too. It's a TREMENDOUS improvement over the way we used to get these reports--well over a month after some of the donations had been made. In spite of the great improvement, there are a few little niggly things that could be improved. One is that you always have to set the date to the current month. 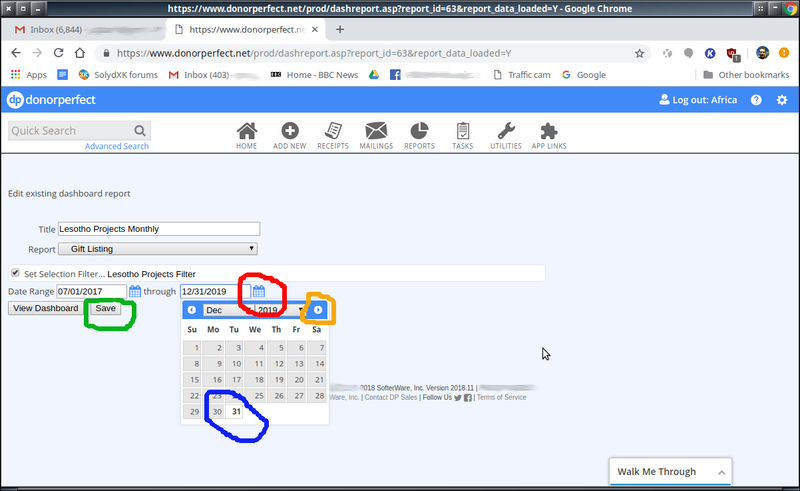 I don't know why this couldn't be done automatically instead of defaulting July 2017--the month we started using DonorPerfect! But, I guess that's a part of the software development process. You may need to click the picture to actually get it big enough to see! 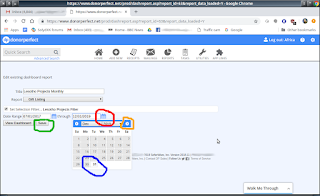 Now, when you run the report, you only have to set the begin date which is easy--click on the arrow (circled in orange) to advance to the correct month, then click the day. It's not perfect, but at least it speeds things up for me! My heart is full of emotions and precious memories as I think back over the five days we spent at Lebakeng, Lesotho. I trust that through this post you will be able to experience just a bit of what we experienced. Perhaps you will remember from our Facebook posts that Pastor Kali and a team of Christians made an initial visit to this village back in February. Their time was short, but they were able to get to know the area, make friends with staff at the Lebakeng clinic, and meet a few people who were hungry for the Gospel. Perhaps most importantly, a lady in a nearby village who was so sick that she could not walk was miraculously healed. As Mark says in his Gospel, this "accompanying sign" confirmed the truth of the Gospel to people in this village, and has opened the door for HIM to start a church there. Our trip actually began a couple weeks before we flew. How? We took our staple foods, bedrolls, cooking pots, and clothes to MAF's headquarter in Maseru to be flown to Lebakeng whenever they had a few pounds of extra payload available on the medical flights to the clinic there. We left Maseru just as the winter sun peaked over the frosty mountains on Thursday, the 2nd of August. The team consisted of Pastor Kali Nthabi, Miss Matlalane Roberts (a godly young lady from Matukeng) HSBC missionary intern Amelia Whinnen, and me (Glenn.) Our MAF pilot was Joey Martin. 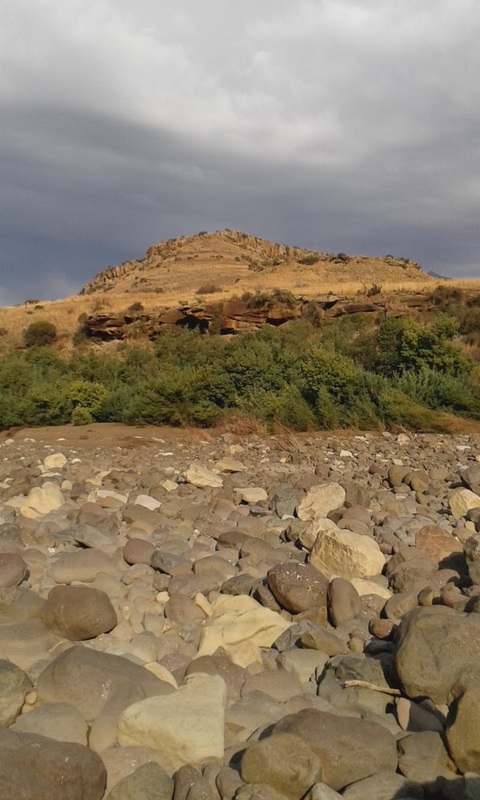 Our route took us southeast over range after range of mountains to the other side of Lesotho. 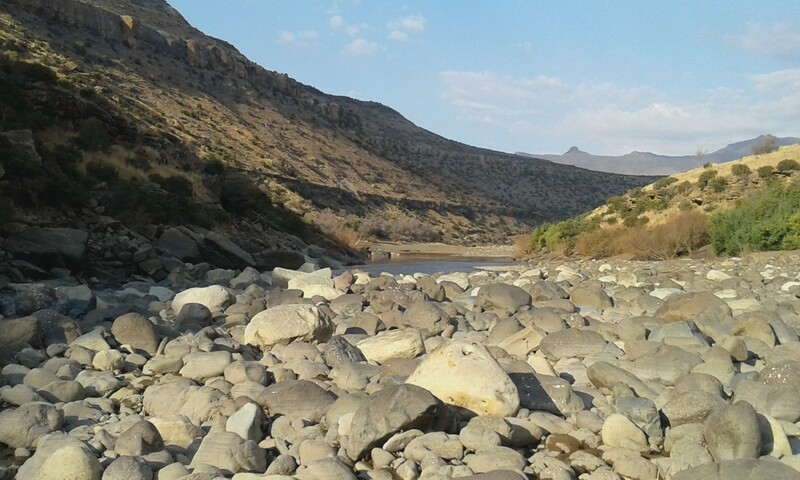 As we crested the last range, Joey began our descent in a long spiral into the Senqu or Orange river valley. 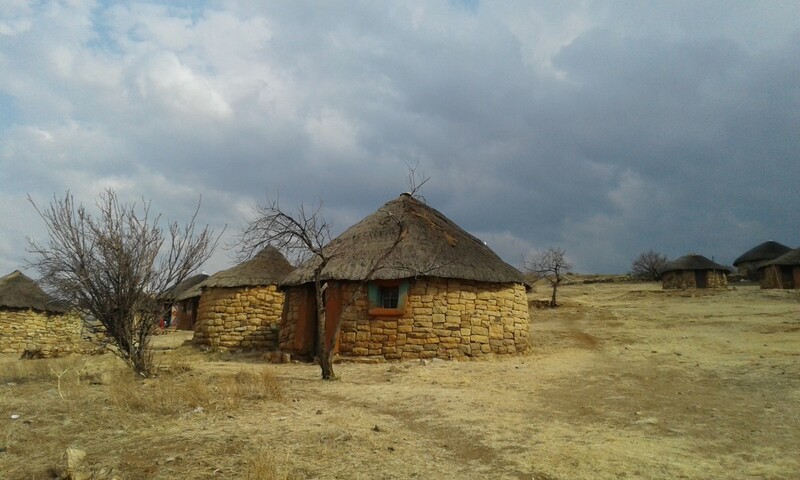 The Lebakeng airstrip and clinic are atop a ridge and hundreds of feet above the river. Even though it's shaky, you might enjoy the video clip of our final approach (below). Originally we had planned to stay with people in the village of Ha Molomo, which is about 2/3 of a mile from the clinic and landing strip. 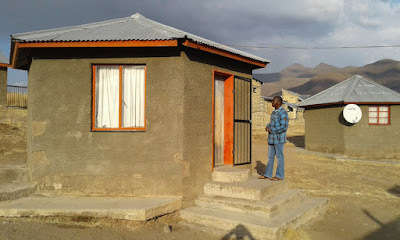 However, the gracious nurse-in-charge at the Lebakeng Clinic, Mrs. Sakala, graciously gave us a room in her house where the ladies could stay, and another nurse who was away for the weekend offered her one-room house to Pastor Kali and I. The conveniences of a solar electric lights at night, and a flush toilet were such a blessing! We are so grateful to Mrs. Sakala and her staff! The house where Pastor Kali and I stayed. As the young ladies began making a bit of lunch for us, Pastor Kali and I hurried off to the village to meet the chief and make arrangements for holding a service in the afternoon. We found the chief, who is a lady, away for the weekend, but her assistant welcomed us and encouraged us to hold services whenever we wanted. He also told us which house in the village had been set aside for us to use as a church. We were so impressed to find this disused house to have a freshly plastered floor--an encouraging sign of welcome and self-sacrifice from some of the villagers. Since the chief was away, we could not confirm the details, but we were made to understand that she was given this rondavel (one-room round house with a grass roof, pictured below) to HIM for a church. This was the house we used for a church. Thursday afternoon we held a service in the village. In spite of an ancestor feast going on in the village, attendance was fair. Many children came, as well as youth and a few ladies. We were especially happy to see the lady who had been miraculously healed back in February! She was so happy to see Pastor Kali and Miss Matlalane again! With only two tiny windows and a door, the "church" was too dark to get good pictures. I didn't want to use a flash during the service, but I did take this picture to give you an idea of what it was like inside. After some lively singing and prayer, I preached a simple Gospel message from Jeremiah 31:31 about the New Covenant that God has made with us through the blood of Jesus. The blood of Jesus changes us and writes God's laws in our hearts. He takes out our old heart of stone and gives us a new, tender heart of flesh to obey Him. (Ezekiel 36:25). When Pastor Kali made an invitation to seek the Lord, almost everyone present raised their hand for prayer. After the dismissal prayer, people went outside, but didn't want to go home. They didn't want to leave the sense of peace and joy that they had experienced as they had begun opening their hearts to Jesus. Eventually we invited them back in the church and prayed for them once more then sent them to their homes. It was a touching scene I won't soon forget. People didn't want to leave after the service. They just stood around looking at us and each other. Friday we held three services, and this schedule kind of became our daily routine. We had an opening prayer with the staff at the clinic around 8:30am. Then we went over to the army barracks where a half dozen or so soldiers are stationed to keep law and order in the Lebakeng Valley. We had devotions with them and were well received. After a quick lunch, we climbed the three-quarters of a mile or so up to the village and held a children's service and an afternoon service for everyone. In the evenings we cooked, prayed, prepared for the next day, and witnessed to some of the clinic staff who live on the compound. 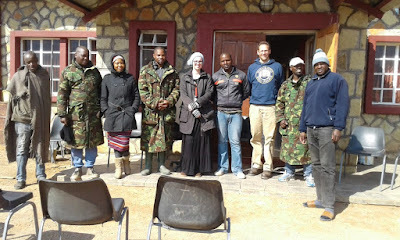 Our time with the soldiers was especially profitable and rewarding. In spite of their rough reputation in Lesotho, they were so welcoming and open to the truth of the Gospel. Though we were only with them four days, friendships were begun that we believe will yield eternal fruit. Monday morning before we left, we went over to tell them goodbye. They asked Amelia to sing "O Lord My God" once more for them. Come to find out, one of them had lost a sister, and his late sister used to sing that song. His heart was deeply touched as he thought about God not sparing His own Son to saving him from his sins. The Saturday afternoon service up in the village was also very special. Pastor Kali preached on "Not everyone who says to Me, 'Lord, Lord,' shall enter the kingdom of heaven, but he who does the will of My Father in heaven." (Matthew 7:21) The Holy Spirit was present to convict of sin and convince people of the truth they were hearing. After the service the lady who had been healed back in February stayed to confess sin, and pray for salvation. Her honesty and humility were pleasing to the Lord, and I believe she was born again. The children really enjoyed the children's services that Miss Matlalane led. I helped her one afternoon by telling a story with a little object lesson about a man who trusted in his good works for salvation. He dreamed that he died and went to the judgment. When God examined his life, all his good works had turned into filthy rags. (Isaiah 64:6). The kids seemed to enjoy it, and I trust the older ones understood the message. We didn't have prayer at the clinic or the barracks Sunday morning since people from these places had agreed to join us for the morning service up in the village. I had a little free time before the 11:00 o'clock service, so I walked the two miles (and almost 700 vertical feet) from the airstrip down to the confluence of the Lebakeng and Senqu/Orange Rivers. Since this is the middle of the dry season, the Lebakeng River was only a brook, and I could have easily waded across the Senqu in the wider spots. But you can see from the pictures of the river valley that things aren't always so calm! In flood, the Senqu fills the whole bottom of the valley (maybe 200 yards) and I estimate it would be 12 or 15 feet deep. 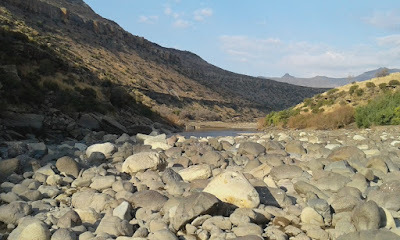 The boulders are testimony to the raging current. The airstrip is on top of this butte. Looking back at the weekend, the highlight for me was the Sunday afternoon service. Not as many people attended, but the adults who did come out seemed to be those who were seriously considering Christ's claims in their lives. Again Pastor Kali preached a simple Gospel message, and the Holy Spirit was at work. At the end of the message, rather than making an invitation, he asked the adults who was honestly willing to surrender their lives to God and live for Him from now on. The four adult ladies in the service all committed to doing this and asked to join HIM's church. It was a moving scene as they were counting the cost, and choosing to follow Jesus. These four ladies agreed to meet together regularly for prayer and Bible reading. 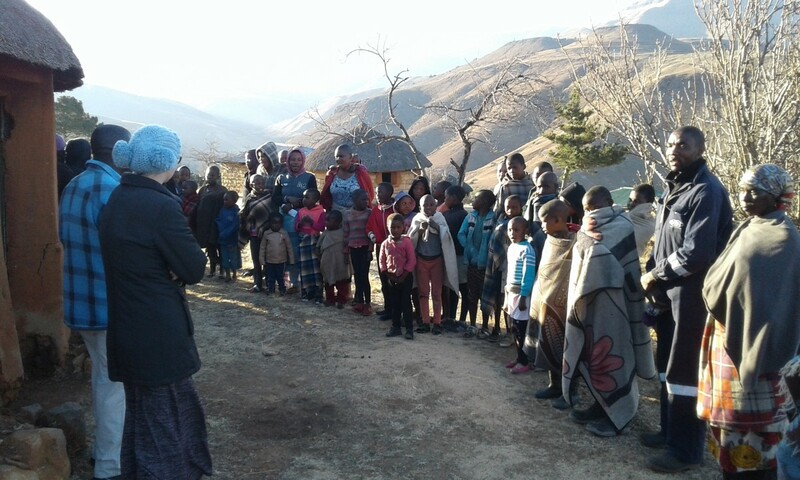 As the last rays of sun faded on the mountains, a new branch of the Church Universal was started in the Lebakeng River Valley! There is MUCH work to be done still! We are praying earnestly that God will open the door for HIM to fly back to this village again within a month. 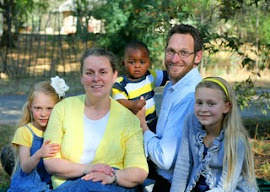 Pastor Kali is hoping to stay for at least a week this time to disciple converts and help them learn to follow Jesus. The challenges of working in remote, unreached areas are great, but as Pastor Kali and I have been talking and strategizing, we have been impressed that the real battle will be won on our knees. Would you please join us in intercessory prayer for this new congregation? Also pray for two men who made a clear commitment to give their lives to the Lord. They aren't from the same village as the ladies, but they live close enough that they can be a part of a church there once it is better established. Especially pray that God will raise up a godly leader in this area to lead this work! Though we left a part of our hearts in Lebakeng, I'll have to admit that I was pretty happy to hear the buzz of MAF's plane descending into the valley to pick us up. Thanks Bryan, for the safe flight back home! I was blessed by the skill and confidence that is clearly evident in your flying as a result of years of serving the Lord in the mountains of Lesotho! Keep up the great work! And if you're interested in aviation, maybe you'll enjoy watching Bryan's perfect landing on the upward sloping runway at FXLK.